Nowadays, research extends well beyond the laboratory. The advancement of technology and social media has allowed for easier communication between labs across the world. The sharing of data between groups allows for more rapid development of scientific research, as well as greater reliability. 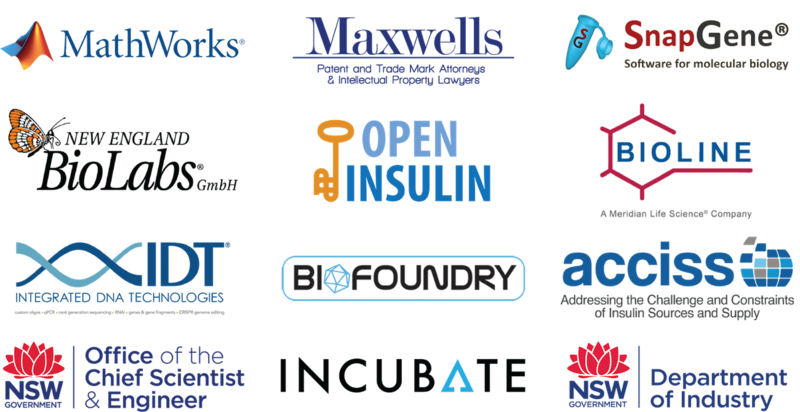 Along with many other teams from around the world, our team took part in the fourth annual Interlab study! The Interlab study is conducted each year by iGEM HQ, and it involves the measurement of Green Fluorescent Protein (GFP) expression within cells. iGEM HQ uses the data collected from this study over many years from many different teams to improve the procedure for GFP measurement, increasing its reliability and reproducibility. We transformed six pSB1C3 plasmids with various GFP test devices inserts, along with a positive and negative control, into DH5α E. coli. Two colonies of each transformant were selected to be measured for fluorescence, with four replicates for each colony for greater reliability. The Interlab study allowed us to use the lab’s fancy plate reader, which is able to shake cultures at 37°C while simultaneously measuring the OD600 and fluorescence at our selected time intervals - for us, this was every 15 minutes for 6 hours. This was a lot of data to go through, however, getting to try out the fancy machine made it worthwhile! Before measuring our samples in the plate reader, the fluorescein standards, which are of a known concentration (uM), were used to calibrate the plate reader and provide a standard curve which would be used in the analysis of our data. 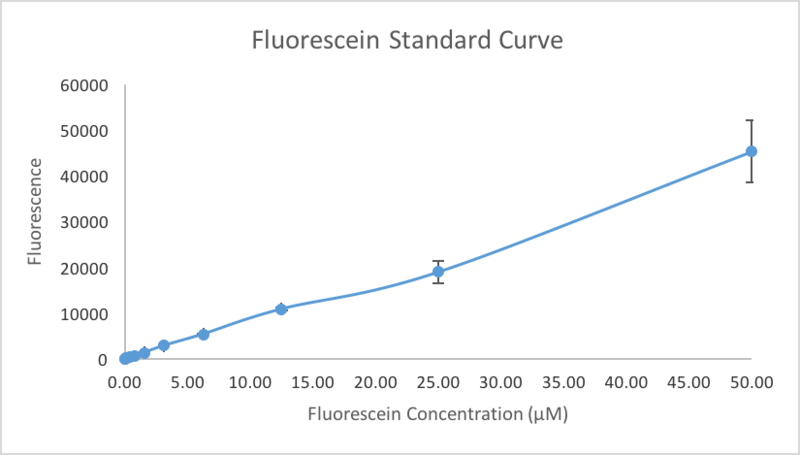 Figure 1: A standard curve produced by measuring the fluorescence a series of dilutions of Fluorescein at an excitation wavelength of 485nm and an emission wavelength of 530nm. The curve above is an average of four replicates of the standard curve measured. A relatively linear trend was observed, with an increase in Fluorescein concentration (uM) revealing an increase in fluorescence. 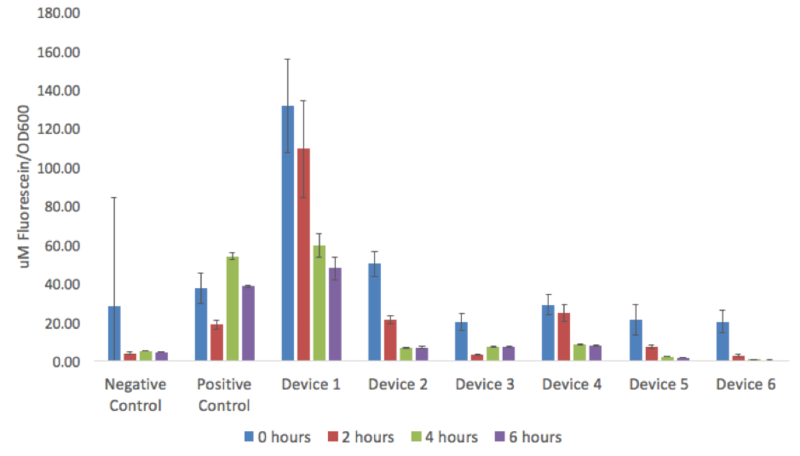 Figure 2: The absorbance of all 6 devices, positive control, negative control, and the LB blank shown as an average of each of the four replicated for the two colonies for each conditions. The errors bars are the standard deviation of the data. All conditions apart from the LB+Chlor blank and Device 1 showed a steep increase in absorbance over time. 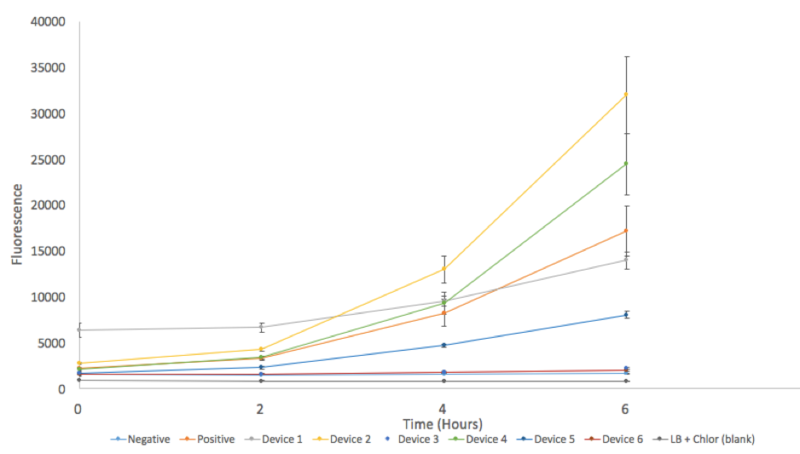 Figure 3: The measured fluorescence of all six devices, positive control, negative control, and the LB blank shown as an average of each of the four replicated for the two colonies for each conditions. excitation wavelength of 485nm and an emission wavelength of 530nm. The errors bars are the standard deviation of the data. All conditions apart from the LB+Chlor blank and Device 6, and the negative control increased substantially over time. Figure 4: The [Fluorescein]/OD600 for each of the devices. 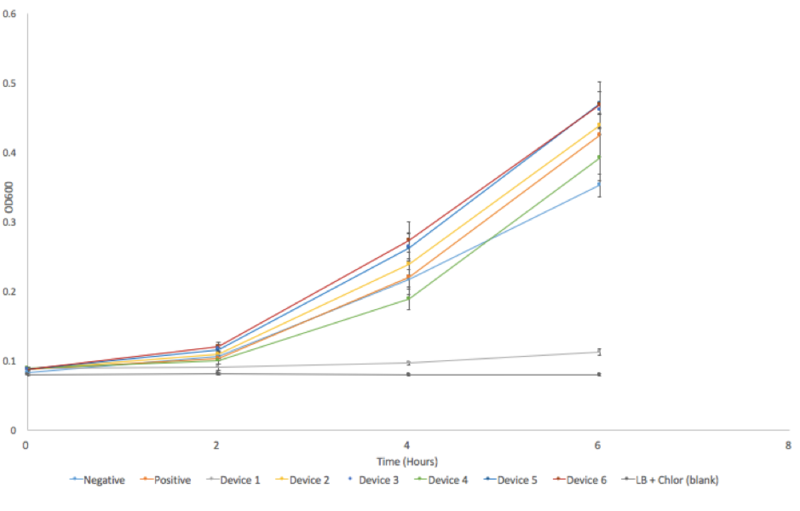 The data presented is an average of each of the four replicates of both colonies for each device and error bars presented are the standard deviation for each of the data sets. The general trend seen in all six devices was that the ratio of fluorescein (uM/OD600) decreased over time. It took many attempts to transform the test devices into our competent DH5α cells. There was generally more deviation between replicates when measuring higher levels of fluorescence. Rather than storing samples on ice, we loaded the cultures into the 96 well plate and left them incubating and shaking in the plate reading while measuring readings. We felt that this would produce results of greater accuracy. Initially, the fluorescence being measured from the standard curve was too high for the plate reader to read. The plate reader settings had to be adjusted in order to give readings.